← Do Machines Go to School? Have you seen our new stamping machine, the Bruderer BSTA 500-110B? It combines the latest technology in pressing with the reliability of Swiss design, producing up to 66000 stamps per hour. No matter how impressed you might be by these numbers, you might also be wondering what is exactly involved in the stamping process. And that&apos;s something we know a lot about! Stamping is the process of manipulating metal. The main item involved is called a die, which has a top and a bottom part. A metal plate is inserted between the two and pressure is applied until the plate is cut in the die&apos;s form. To help you picture it in your mind, compare it to the process of cutting dough in the kitchen with a pasta cutter which allows you to cook your favourite tagliatelle. One of the main advantages of the stamping process is that once you&apos;ve designed a specific die you can produce infinite quantities of components with it. This is what makes stamping an ideal process of mass production. Stamping is also a cold-forming operation, because no form of heat is introduced into the die or the metal sheet. However, the stamping process does generate friction, and that is the reason why the stamped product that exits the die is usually very hot. In this process the metal is processed into a product just by applying pressure. There is a part pulled out of the metal which then turns into the product. As the name suggests, the metal is bent to transform it into the product. There are different kinds of bending such as sharp bend, round bend… etc. This process involves some forging. Integrated moulding prevents little pieces of metal escaping during the forging process due to the pressure applied. It also allows stereoscopic processing. 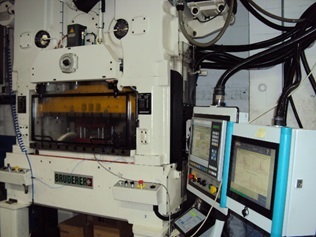 These are the two most used machines in the stamping process, and each of them comes with specific characteristics. A mechanical press has a flywheel that stores the energy that is then transferred to the punch and to the work piece. They can have different sizes, from 20 tons up to 6000 tons. They can give up to 1500 strokes per minute when they&apos;re used at their maximal speed. They are very good for high-speed blanking, shallow drawing and making precision parts. A hydraulic press uses hydraulics to deliver a controlled force. They are usually bigger than mechanical presses as they can weigh as much as 10000 tons. Their speed and stroke can be adjusted depending on the specifications of the product. For instance, they can deliver the full power at any point of the stroke or a variable tonnage with overload protection. Hydraulic presses are ideal for deep-drawing and compound die action. Here at European Springs we&apos;re experts on stamping and pressing. Our expert team will work with you from the outline of your project to the delivery of the product, because your satisfaction is our main goal. Don&apos;t hesitate in contacting us today and we&apos;ll be happy to help!